Falcon American Oil provides oil and gas drilling prospect generation, management, project supervision, prospect evaluation, and risk assessment. A short description of each service is listed below. Falcon American Oil performs regional basin studies to extend the industry search for new potential oil, gas, and mineral reserves. These studies help establish budgets, define prospects, and plan geophysical exploration programs, allowing us to generate a full field development plan. Probability analysis is the process of analyzing the information found in the initial analysis of the land. Regional geology, geophysical interpretations, and analogy to similar structures or traps are incorporated in the assessing of the risked potential of an exploration prospect. The risk-adjusted return is filtered, allowing for the prioritization of each prospect. Monte Carlo or other probability analysis techniques can be incorporated in our studies using the commercial or proprietary software for reducing drilling risk and maturing the prospects. Falcon American Oil has the knowledge and capabilities to utilize satellite HC Imaging. This process allows us to apply advanced Satellite Hydrocarbon Imaging (SHCI) surveys within an area. Once that has been finished, we can utilize remote satellite survey results. This data is then integrated with other geological/geophysical surveys to identify trapping systems and also to precisely detect the potential hydrocarbon anomalies. FAO collects multiple data sets to enable risk-adjusted assessments of potential prospects. Passive Seismic technology, also known as Reservoir Hydrocarbon Detection (RHD) helps reduce drilling risk and promotes cost-effective drilling campaigns with very little impact to the surrounding environment. This technology also allows the mapping of oil boundaries with volume calculations of the prospective reservoir for multiple depths. Areas of interest can be targeted for assumed efficiency and further data acquisition in order to choose the most abundant source. RHD can identify barriers and boundaries within the prospects and oil fields by detecting potential sedimentary boundaries and sealing faults. Falcon American Oil also utilizes Gravity and Magnetic Imaging. This technology uses advanced gravimeter tools for gravity field surveys. 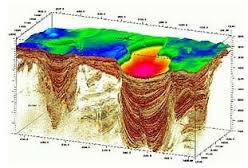 The data collected is used with 2D/3D seismic, passive seismic, and geochemistry maps. This technology allows us to identify the structural basin system and can detect potential hydrocarbon anomalies. FAO is capable of performing the acquisition, processing, and interpretation of all data as well as the integration of related technical information into final reports. Falcon American Oil facilitates the development of quality drilling projects throughout the state of Michigan and the United States. We provide our investors with advanced technical services to find and develop oil and gas cost effectively and efficiently.